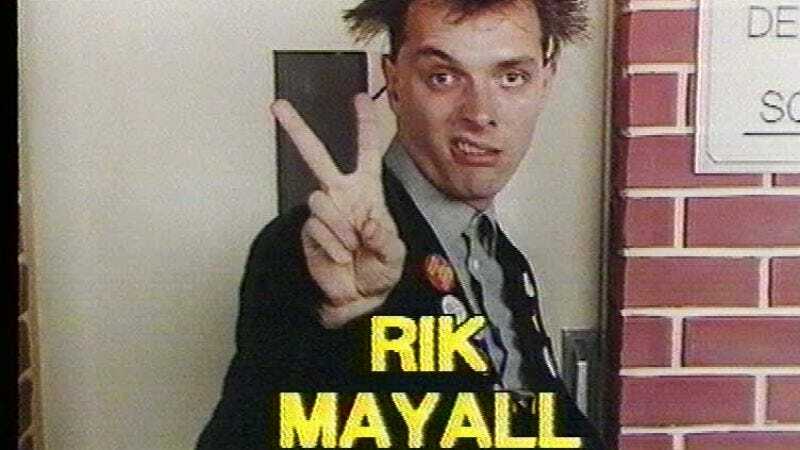 The BBC is reporting the death of Rik Mayall, the British comedian and actor best known for playing the pretentious, callow anarchist Rick on The Young Ones, and for roles in films like Drop Dead Fred that made similar use of his skill at playing snot-nosed annoyances. Mayall was seriously injured in a quad bike accident in 1998 that left him comatose for several days, but he had since made a slow yet triumphant return to performing, often alongside his longtime comedy partner and Young Ones co-star Ade Edmondson. Mayall’s cause of death has not been released. He was 56. Mayall and Edmondson first met at the University of Manchester, where they forged their partnership amid the burgeoning “alternative comedy” scene at The Comedy Store. In addition to fostering their particular chemistry as “The Dangerous Brothers,” one marked by cartooonishly violent outbursts and explosions, that club also saw Mayall first develop the character of “Rick,” an anarchist poet who was also a total prick, as well as Kevin Turvey, an investigative reporter whose “reports” mainly consisted of long, rambling monologues about his own life. Turvey became part of the 1981 sketch show A Kick Up The Eighties and landed his own one-off BBC special, while Mayall’s continued work with Edmonson and other Comedy Store alumni like Alexei Sayle, Nigel Planer, and French And Saunders—all of whom had since formed their own club, The Comic Strip—led to the Channel 4 series, The Comic Strip Presents. Around the same time, the BBC commissioned The Young Ones from Mayall and his then-girlfriend Lise Mayer, adding their university alum Ben Elton as a writer. The series—about four undergrads whose only commonalities were slovenliness, their desperate unpopularity with women, and a shared distaste for work and for each other—saw Mayall reprising his pompous, Cliff Richard-loving poet character Rick, alongside Edmonson’s destructive punk Vyvyan, Nigel Planner’s irritating hippie Neil, and Christopher Ryan as the unctuous “cool person” Mike. While each have their own particular charms—or lack thereof—it’s Mayall’s Rick who tends to dominate Young Ones episodes, often by virtue of the character’s relentless, hyperactive toddler’s need for attention. Mayall’s portrayal treads that fine line between obnoxious and pitiful, as the sniveling Rick’s self-satisfied—and woefully ill-informed—political diatribes and awful slam poetry is that of every irritating college leftie writ loud. Yet, as Mayall plays him, you can’t help but feel for the little wanker. Bottom remains one of the crudest and craziest ever aired on television in any nation, and eventually carried over into a series of extremely popular (and far nastier) live tours that continued through 2003. It also spawned the 1999 movie Guest House Paradiso, in which Mayall and Edmondson reprised their characters in sensibility, if not exactly name. An official TV sequel, Hooligan’s Island, was announced by the BBC in 2012, but Edmondson pulled out several months later, citing a desire to pursue other things. Mayall’s television work also included roles on Blackadder, where he played first “Mad Gerald,” then the swashbuckling, sexually virile Lord Flashheart (as well as his WWI-era descendant) in the time-hopping series. He also stepped away from playing wild-eyed, bohemian types to become the smooth-talking—though equally untrustworthy and awful—politician Alan B’Stard of The New Statesman. The show ran for four series and a handful of specials, while Mayall’s B’Stard lived on through stage shows, commercials, and even tongue-in-cheek editorials written in character for British newspapers and tabloids. On the big screen, Mayall had his biggest introduction to American audiences (those who hadn’t already been watching Young Ones reruns on MTV, anyway) in 1991’s Drop Dead Fred, where he brought all his talents for being irritating—yet sympathetic—to bear on the part of Phoebe Cates’ imaginary best friend, who reemerges to wreak havoc on her grown-up life. The movie garnered a lot of the same criticisms for crude, juvenile humor that dogged Mayall throughout his career, though it was a modest success for an independent film. Nevertheless, it remains beloved by a generation who caught it multiple times on cable (and were strangely moved by its poignant ending). Mayall’s other movie credits include roles in Richard O’Brien’s Rocky Horror sequel, Shock Treatment; a small part in An American Werewolf In London; starring opposite Crispin Glover in the straight-to-video curiosity Little Noises; taking part in the 31st and final entry in the legendary Carry On series, Carry On Columbus; and lending his voice to children’s films like The Princess And The Goblin, The Wind In The Willows, and A Monkey’s Tale. In 2001, Mayall played the prankster poltergeist Peeves in Harry Potter And The Philosopher’s Stone, only to learn at the film’s premiere that his scenes had been cut. On stage, Mayall was a constant presence at Comic Relief shows, often performing alongside Edmondson. (Their last team-up, in 2011, saw Edmondson performing a ballet, only to be interrupted by Mayall hitting him in the face with a frying pan.) Most recently, he co-starred on the Channel 4 sitcom Man Down as the overbearing and undermining father to Greg Davies, despite being barely a decade older. And in one of his final turns, he lent his voice to the comedy short “Don’t Fear Death,” where he gushed in his instantly recognizable, excitable voice about all the joys of being dead. Sad as it is to lose Mayall, that one of his last performances would be gleefully extolling the virtues of dying would no doubt greatly amuse him. Don't Fear Death from Dice Productions on Vimeo.